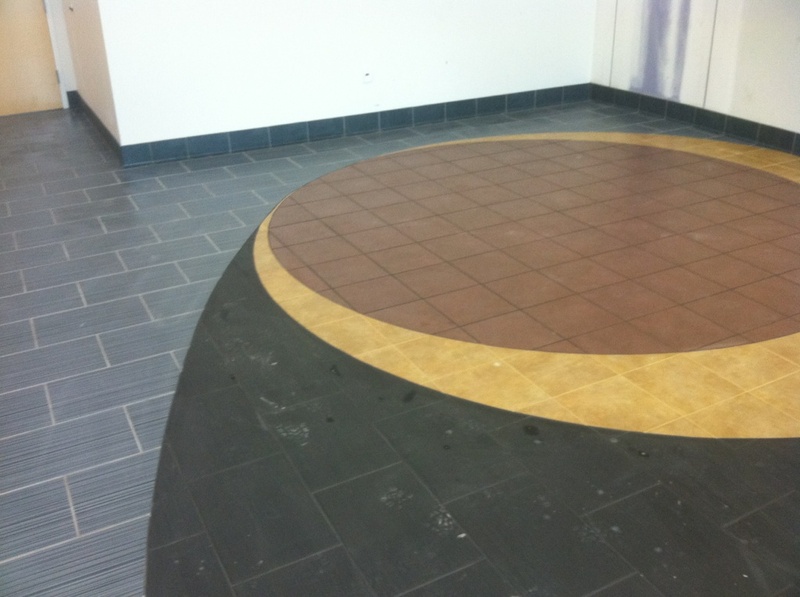 The precision cuts of four different sized and colored tiles in concentric circles was certainly challenging for our certified installers, but it was the know-how of our staff and the capabilities of TEC’s products that set them up for a successful installation. Making circles from square tiles takes math and artistry. We appreciate this high praise from an architect, and are glad that we, and he, can be sure the products and workmanship underneath this detailed work is as good as what is seen on the surface. Thanks, TEC, for the helpfulness and technical capabilities of your staff and products! We were asked to participate on a local expansion project because the general contractor knew it would be a specialty installation. The client and architect’s specifications required intricate layout, precision cuts, multiple tile sizes and colors, and working within the parameters of a very controlled site environment. As is usually the case, our team was involved in multiple communications and meetings long before the tile installation began. The bathroom installations were to be wall-tile only, and the floors were scheduled to receive an epoxy coating. However, the epoxy contractor had no idea how to create the slope to the drains nor how to waterproof the installations. Since bathrooms are our area of expertise, we suggested using TEC’s Hydraflex waterproofing membrane and helped resolve the issue for everyone. Our next challenge was in the 4000-square-foot lobby, cafeteria and kitchen areas. Because of the high-PSI requirements for the concrete on the plant floor, all the concrete on the project was poured to that specification, including the lobby and kitchen areas. The concrete had been ‘wet-cured’ which produced an extremely hard and impervious surface on which we were to bond our tile flooring. The welded sheet vinyl contractor on the project had tried to shot-blast the surface of the concrete, but had absolutely no success. Our superintendent did a water-penetration test on the lobby concrete and knew there would be issues in achieving proper bonding when the tile was installed. We called the technical support staff of TEC products and asked if their new Multi-Purpose primer could be used to rectify the problem. They provided assurances and written warranty explanations that helped convince the general contractor that the proper use of TEC’s primer over this substrate would provide the best possible solution. This process would also require less labor, time and materials than the usually prescribed subfloor treatments of shot-blasting or scarification, and would also allow the project to stay within its already tight construction schedule. We proceeded with installation of the lobby, cafeteria and kitchen tile with TEC Three-in-One mortar and Accucolor grout. (These TEC products had been in our original submittal package due to the project’s high visibility and challenging installation specifications.) The general contractor was very comfortable with these products and helped convince the architect and owner that TEC products would give them the long-lasting installation performance they wanted. Excellent materials combined with the know-how of your local Five-Star Tile Installation Contractor once again achieved great results! Categories: Ceramic tile, Installing tile and stone, Tile installation expertise | Tags: Customer satisfaction, Five-Star Contractor, Installation expertise, Local tile expertise, Quality tile contractor, Raleigh tile installer, tile professionals | Permalink.